Always, there are the insights of people who are part of our lives, but just outside the inner circle of our immediate home life, to bring an objective perspective to what we do. With a word, a phrase, we suddenly see our everyday actions in a different light. Last night, my sister stopped by my house on her way home from work. 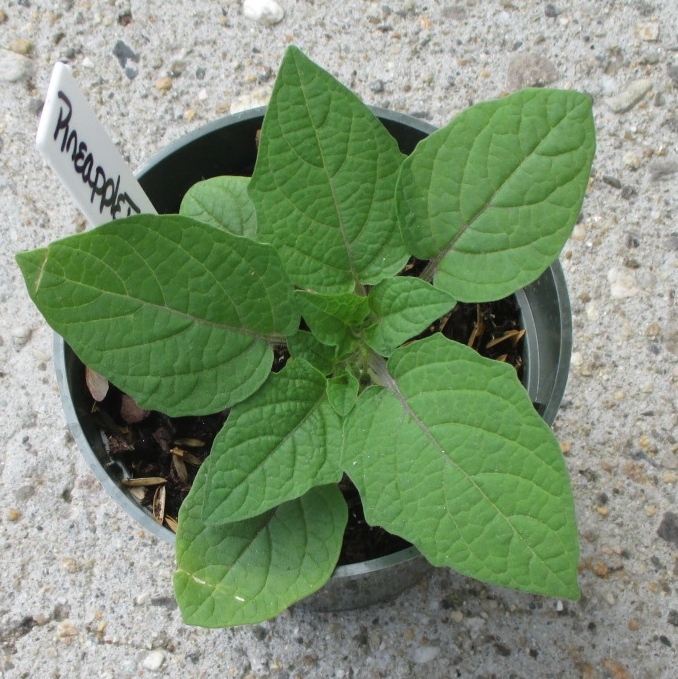 I had picked up some plants that she wanted for the garden, but I did not want the responsibility of keeping them alive through the predicted weather of another night of drought or severe thunderstorms—either seemed a distinct possibility. So she agreed to pick them up. She arrived as we were eating dinner, and since part of our meal contained none of the ingredients that trigger her allergies, I offered her some food, and she accepted. Which is a long-winded way to say she hung around for a while. After dinner, there was some talk of who was responsible for the dishes, and it was determined that it was J’s night. She promptly left the room, stating that “the leftovers needed to be left-overed” before she could begin. She spent the next ten minutes flitting in and out of the kitchen—complete with her J-like theatrical flourish—while I talked with Auntie. The cat came in from outside and proceeded to regurgitate the organic material he had ingested—as cats do—onto the kitchen floor. It was a lovely addition to the non-stop-ness of the evening. J flitted back into the kitchen. “Steps wide over the cat vomit,” she announced as she lifted her foot in an exaggerated dance-step over the puddle the cat left behind. I laughed. How many times had I heard one of the kids narrate his or her actions? How many times had I done so myself? Often, I would make a similar statement as I stepped over a child sprawled on the floor; my objective was first, to let the child know that I was trying to avoid him or her, and second, to let the child know that he or she was smack in the middle of the pathway through the room. But this statement—a simple observation—from my sister helped me to reframe these narrations. They are like stage directions, and they tell the actor or actors what to do and how to do it. I think I’ll work on that…. For much of the week, the students at the school where C has his culinary program have been taking a new, way too time consuming standardized test (because another test is a good use of their time). So there has been no Voc program first thing in the morning. Needless to say, he has been getting up a few minutes later than usual. Friday morning, he was back to the regular schedule. On Thursday night, he made it a point to tell me that he needed to get up in the morning; that I should not let him sleep in, as I have been. That is an interesting interpretation. I have been getting him up as usual, then calling to him more than usual—and more urgently than usual—to get him out of bed. “Make sure I’m out of bed early in the morning,” he told me. “I know, but that’s because I don’t have to leave as early. Tomorrow, I need to get out of bed because I have to go.” True enough. In the past, I have used a number of tactics to wake this sleepy head. When he was little, I would roll up socks and throw them at him. I tried a water gun once. I would sing to him. I tried tickling his nose. I put rings on all of his fingers while he slept. I contemplated applying make up…. Now, I have one tried and true way to wake my reluctant teen and get him moving, but it required just a bit of advance planning. I pulled out my supplies and started baking. 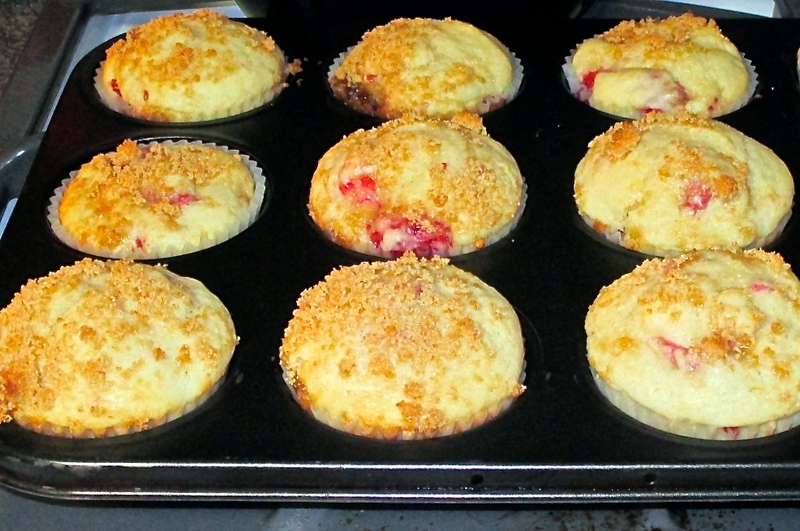 We would have raspberry muffins for breakfast! W walked by me, fully dressed and ready for the day. “I’m going downstairs to eat all the muffins!” he reported. That did the trick! I just hope C can find someone to bake for him when he goes off to college…. We have been sick at our house for what seems like forever. The normal winter viruses hit hard on the first day of spring, and they haven’t stopped. C has spent the spring struggling with bronchitis, pneumonia, bronchitis, etc. It’s a nasty cycle, and with the number of viruses that have gotten him, it just keeps cycling. The rest of us have been cycling in and out, so there are generally two of us sick at any given time. Enough already. Meanwhile, W has spent the spring talking about 3D printers. He wants one. Badly. He also has enough money saved up to buy one. The kid doesn’t even have a job, but somehow, he has collected enough money in his bank account to pay for a 3D printer. A friend of his has the one he wants, so he knows how it prints pretty well. After awhile, I just go with it. Whatever comes out, I fly. “So, this 3D printer I want…” he starts in for the gazillionth time. He looked at me, speechless for just a split second. I had stopped him in his tracks. He shook his head. “Not with the one I’m getting.” He paused to breathe, as he does when he is trying to shift the direction of the conversation. “I KNOW! !” I said, an idea taking shape in my head. “You could print a new set of lungs for your brother!! Clearly, he could use them.” I pointed to the coughing, hacking, wheezing (and laughing) C across the table. We were on vacation recently, staying in a place that has all sorts of fun things to keep active kids of most ages occupied and entertained. One of these attractions is a Fun Barn in which there is a bounce house, a ping-pong table, a climbing wall, and an area in which kids (um… and adults) can have nerf-ball battles. This area is caged in with netting and has hundreds of foam balls with several air powered shooters strategically placed around a climbing structure with a slide, making it easy for groups to have rousing battles. So we did. It was after dinner on our last night. As four teenagers and two adults, we were able to have quite a battle before some younger children showed up, and we had to turn the energy down a notch. It was getting dark by then, so we decided to leave the Fun Barn to walk back to the lodge. It was chilly for the end of April, but the days were getting longer, the snow had finally (mostly) melted, and the flowers were starting to bloom. 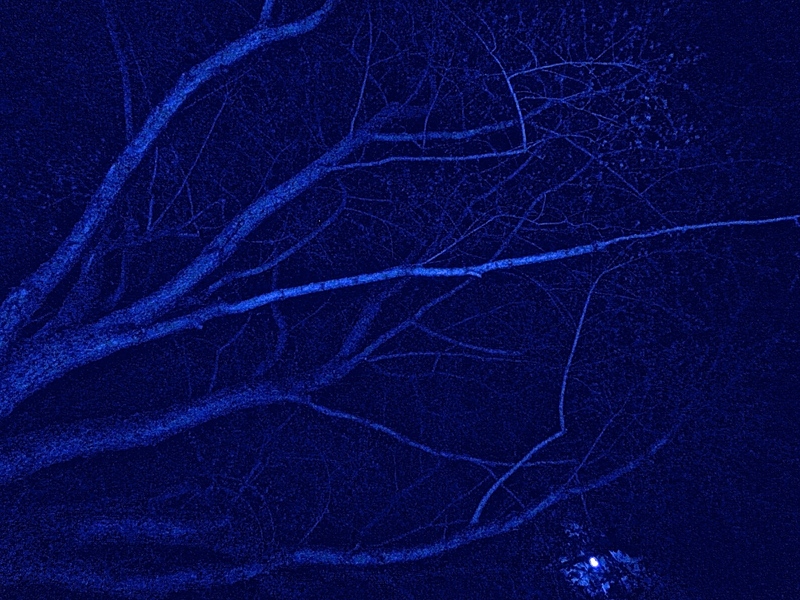 We could hear spring peepers off in the distance. As we exited the Fun Barn, J wanted to go to the playground. It was getting dark, and the sign posted on the playground fence claimed the area closed at dusk. But a simple sign would not deter J. “Let’s just go see,” she said, running ahead with W to check out the playground. “The chain’s not up!” she reported of the yellow plastic chain used to discourage after hours playground use. Gleefully, the two of them slipped through the gate and ran to the merry-go-round. Not a carousel merry-go-round, but a playground merry-go-round—the kind that most schools did away with years ago as children flew off when they spun too fast and couldn’t hold on. My two each grabbed a side and started running to get the merry-go-round moving. “When I say THREE, jump on!” called W. “One, two, THREE!” They both landed with the muffled thud of rubber soles on metal platform. They hung their heads off the edge, hair flying up in the centrifugal force. They completed this exercise several times before their activity diminished to lying on the platform while the movement slowed, looking up at the branches of the tree above. “Mom, can I have your camera?” J asked, and I handed it over. She started taking pictures from her spot on her back looking up at the sky. She spent several minutes clicking, checking the the screen, sighing and trying again. What she didn’t realize was that it was too dark for pictures. And she also didn’t realize that what she wanted to capture was not the branches above her and the moon in the background. She wanted to capture the moment, the feeling of a beautiful spring night, vacation, and family time spent together. She wanted to capture the spinning, the breeze, the feeling of going nowhere, and the thrill of the ride. It was Friday morning, and we had just returned from a short vacation the previous evening. We had little food in the house—other than crackers and chips—so I was going to have to go shopping, both for food and for inspiration. “What do you want for dinner?” I asked J as we scrambled up some eggs for lunch. The question always presents a challenge—both for me and for the ones answering—but this time, I had no ideas and needed direction. Popovers have become a favorite food item in our house, though when the kids were younger, they used to eat the egg-y middles, leaving the crispy outsides. 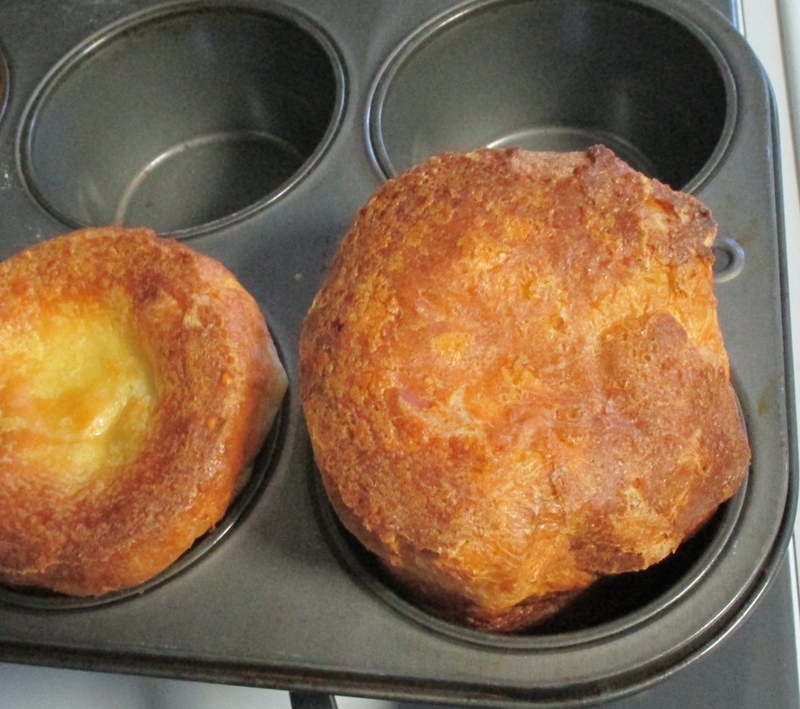 As they grew and their tastes matured, they began to devour fresh-from-the-oven popovers in their entirety. With my work schedule, however, I tend to make them as a weekend or vacation treat. But on this day, I had time and it was still chilly outside, so popovers seemed like a good choice. “And make a lot so we won’t fight over them,” she added, thinking ahead to the need to accommodate her teenaged appetite. “Hmm. What do you want to have with them?” I questioned. Because I consider popovers to be cold weather food, we often pair them with soup or stew, but the beginning of May is no longer soup and stew season. “I don’t know,” she replied. “Whatever.” And once again, I was on my own to think about what else to serve. Later, when C finally got out of bed and came downstairs, I asked him the same question. (I didn’t ask W since he is still outgrowing his childhood pickiness and would be happy to eat pasta three meals a day, seven days a week. Then again, pasta is always a good choice…). Agreement! Because my children had been fighting all week, I had to give them credit for actually agreeing on something. Not that the choice of dinner is earth shattering, but I suppose it’s a start. And they both specified that I would have to make more than usual, so the “shortage” wouldn’t incite an unnecessary argument. Clearly, we would have popovers for dinner. Some days, I’ll take whatever I can get.